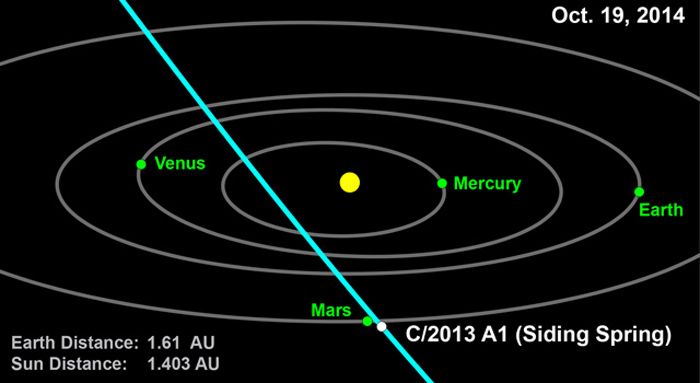 The latest trajectory of comet 2013 A1 (Siding Spring) generated by the Near-Earth Object Program Office at NASA's Jet Propulsion Laboratory in Pasadena, Calif., indicates the comet will pass within 186,000 miles (300,000 kilometers) of Mars and there is a strong possibility that it might pass much closer. The NEO Program Office's current estimate based on observations through March 1, 2013, has it passing about 31,000 miles (50,000 kilometers) from the Red Planet's surface. That distance is about two-and-a-half times that of the orbit of outermost moon, Deimos. Scientists at the Near-Earth Object Program Office estimate that comet Siding Spring has been on a more than a million-year journey, arriving from our solar system's distant Oort cloud. 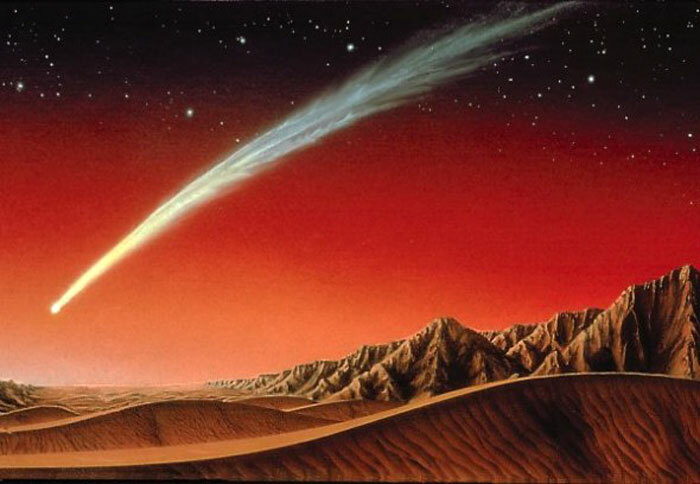 The comet could be complete with the volatile gases that short period comets often lack due to their frequent returns to the sun's neighborhood. If Siding Spring would hit, the force of impact may truly be monumental. Based on observations to date the comet nucleus could be a real monster – as big as 9 miles (15 km) to 31 miles (50 km) wide. With it’s velocity clocked at 35 miles (56 km) per second, the energy force of the collision could be measured in the billions of megatons, resulting in a crater hundreds of miles wide. This could be an impact that rivals the one that wiped out the dinosaurs 65 million years ago on our planet and would be bright enough to be even seen with the naked eye from Earth. Chances are however that it will just barely miss the planet, but comet Siding Spring may still become visible through binoculars and backyard scopes for us Earthlings in the Southern Hemisphere around mid-September 2014. It should also produce quite a sky show as seen from the surface of Mars.